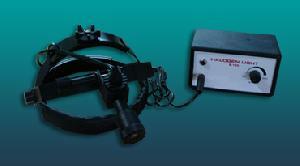 ROSLANE MEDITECH are eminent Indian Exporters of various types of Surgical Head Lights. offers, various models of Export Quality Surgical Head Lights, Dental Head Lights and ENT Head Lights, at most affordable price, as per the buyer�s need. Halogen Head light for true tissue color and consistent. Long lasting Illumination. Iris diaphragm regulates diameter of Light Spot. The Halogen illumination of the lamp offers an optimal light intensity, which may be regulated by a switch. The practical plastic design offers easy handling due to low weight. Head may be exchanged without removing the headband. The plug transformer 6v supplies the required power.